And when I tried to upload I just found them so bad :( and later planned to cook up something special the next day Gulab Jamun :D and a bright sunlight to give me company. Went ahead and was nothing less to add to my worries the jamuns scattered in oil.... :( I have no clue what happened. Next to lift up my spirits made biscuits and that was another disaster so told myself that this just wasn't my day! And I was not ready for another one and called my husband, decided to go for dinner since it was thanksgiving day... And the next hour the wind started blowing and it started to pour and you know plan was cancelled :( and ended up cooking at home... The rains were so bad that we could not sleep and ended up praying and finally it all started to become calm... So what I learnt is that be thankful and all your storms may seem to calm down, be happy and move on... can that get any perfect for a Thanksgiving post??? I am so happy and delighted to share my 100'th post with all my friends, family and readers. Blogging has given me a passion to cook more and a great bunch of friends who encourage me a lot. I am really blessed to have such lovely people around me and in a very short span. 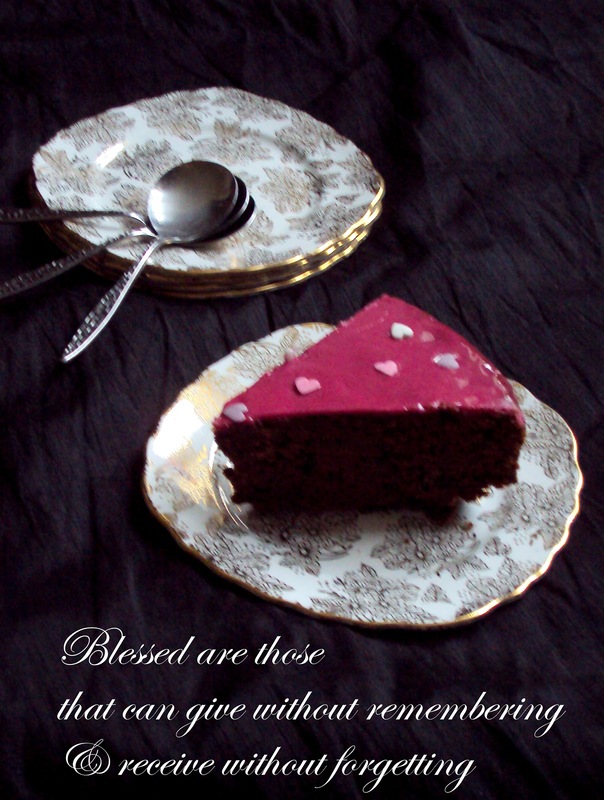 Thank you to each one of you who have encouraged, read, criticized made my day with your lovely and thoughtful words. This means so much to me, there could not be a better day to share my joy with you ♥ Happy Thanksgiving !!! 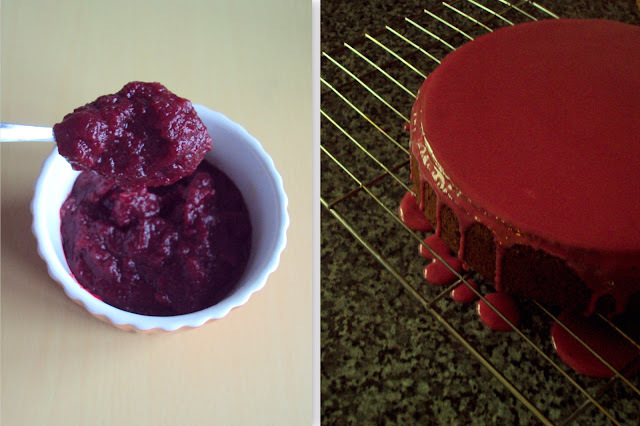 Chocolate Beetroot is an unusual combination but one that works great and results in a super moist cake. 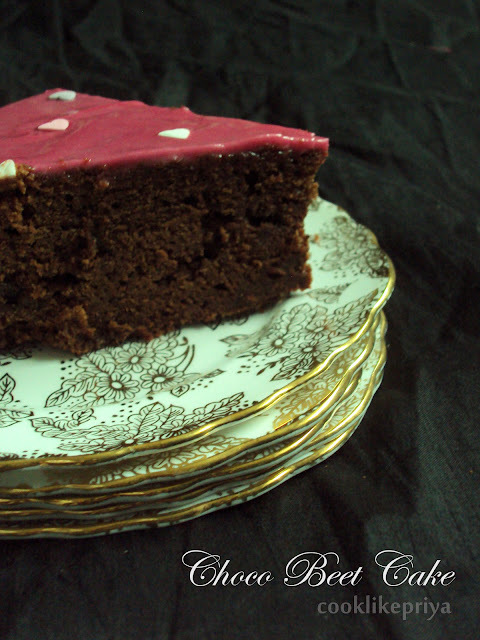 Using light olive oil instead of butter and this cake is for someone who wants to eat a healthy dessert keeping in mind the goodness of beetroot and dark chocolate. Now make a well in the dry ingredients and add the wet mix little by little to form a smooth batter without lumps. -The cake is perfect in sweetness hence do not reduce the sugar content. awesome Priya! Truly tempting, loved your clicks too. Wow. Firstly congon your 100th post. So pretty pink and the cake looks lovely. Marvellous cake Priya, congrats on ur milestone dear, Keep on going. 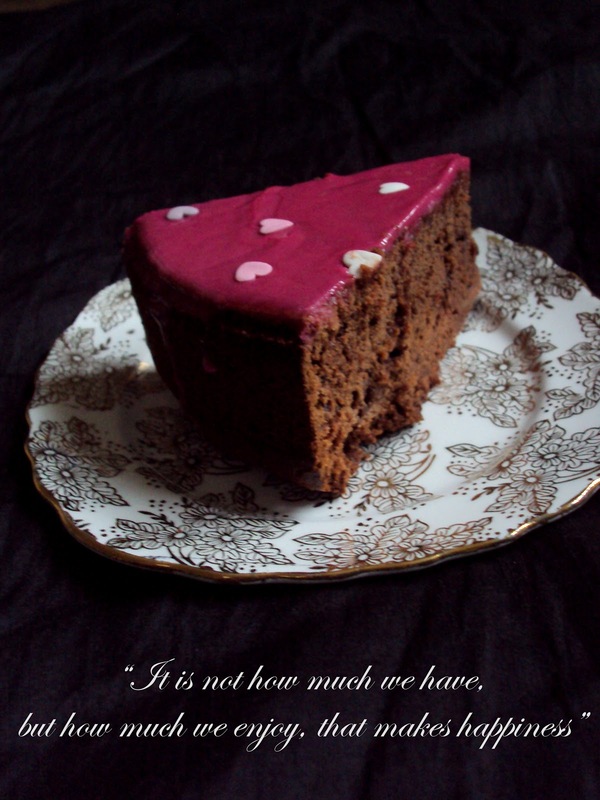 Am yet to try beets in cake, now you are pulling me to make some soon,cant wait to make some. Congrats on your 100th post, cooking mishaps will happen, but you learned lot from that. so next time when you cook, you are expert. 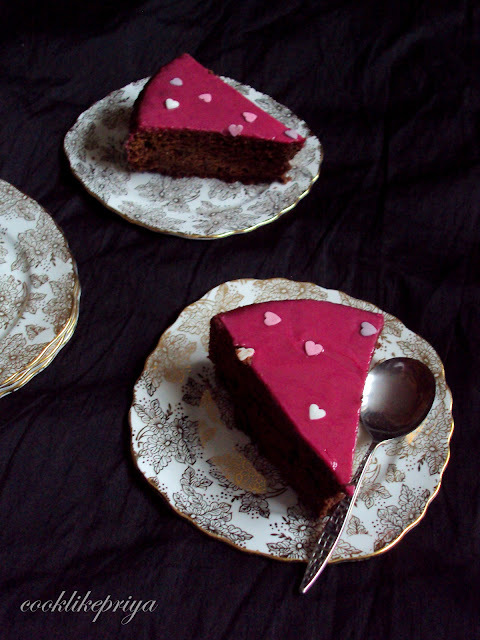 Beautiful beet cake. Congrats on your 100th post, Priya and also Happy Thanksgiving!! Delicious & lovely looking cake..
Gorgeous cake Priya,congrats and even I also had the same memory problem while trying to upload photos..
Congrets Priya. Looks ymmm with beetroot juice. This one cake which I have not tried yet...now u are tempting me too...love the glaze. so tempting sis.choco beet combo excellent. Nice to meet you and congrats on your 100th post!!! The kitchen disasters mostly happens to me when I am in the urge to post something really bad and I had gone thru the same dilemma of what to do with the unsatisfactory picture that was taken. Nice reading your post and the cake looks yum.